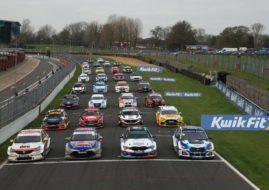 In the 30-minute long qualifying session for BTCC races at the Snetterton circuit, the fastest racer was the current champion Colin Turkington in Team BMR’s Volkswagen CC. Turkington has taken pole position for Race 1 tomorrow with a record time of 1.56.047 on a 2.99-mile track. His teammates Aron Smith and Jason Plato were second and third respectively. Smith was slower by 27 thousands of a second and Plato 71 thousands of a second. The first three drivers were not the only ones to have a very narrow gap amongst them; the competition was equally tough for the 6th and the fourth positions. Andrew Jordan, who was the fastest in second Free Practice earlier today, was 0.193s slower than Turkington and got a fourth position on the starting grid. Jordan’s MG6 was just 3 thousands of a second faster than Matt Neal in Honda Civic Type R. Sixth placed Andy Priaulx in West Surrey Racing BMW 125i M Sport was 3 thousands of a second slower than Neal. Jordan’s team-mate Jack Goff was seventh in the Triple Eight Racing’s MG6, ahead Sam Tordoff (WSR, BMW) and Tom Ingram (Speedworks, Avensis). Another BMW by Rob Collard rounded the top 10. Despite big expectations after good results at the Dunlop tyre test at Snetterton last month, Motorbase Performance’s leading driver Mat Jackson was only 14th in the qualifying. His team-mate James Cole in other Ford Focus was 20th. The current leader of the championship Gordon Shedden had 75kg success balast on his Honda and finished 16th. A total of 28 drivers took part in the qualifying session. Laser Tools Racing’s Aiden Moffat retired from the competition after a heavy crash in second free practice session. Moffat crashed with Mercedes A-Class and was conscious after the accident but medical crew transported him to the hospital for precautionary scans. Three races are scheduled for tommorow at 12.02, 14.35 and 16.57 (local time). Check out all the latest results on SnapLap result pages.